Walls topped a 17-car field on a special Tuesday event. ... Cruz Wallace won the 602 Crate feature. Dalton Hood won the 602 Crate feature over Todd Jones. Putnam set fast time and lapped the field after starting on the pole, but he lost an engine with three laps to go, handing the victory to Brocato. ... Cruz Skinner won the Crate Late Model feature. Joe Noojin won the Limited Late Model feature. ... Andy Picklesimer (604) and Justin Angle (602) won Crate features. Laney swept two nights of action in the inaugural tribute to Teddy and Linda Martin. Crowder, who overtook Bo Allen for the lead, earned $3,000 in the Southern Clash victory. ... Jason Fitzgerald was running second when a tangle with a lapped car sent him to the pits; Fitzgerald returned but got into the turn-two wall. Driving the car owned by Jim Powell and Andy Picklesimer, Hickman led all but the first lap. ... Hernandez improved six positions in the 16-car feature. ... Polesitter Jesse Lowe won the Crate feature over John Ownbey. Collins also won the Crate feature. Bubba Pollard, grandson of track founder Hence Pollard, won the 604 Crate feature. ... McKenna Nelms, a 15-year-old high school student, held off Buddy George in the 602 Crate feature. Gentry won on the undercard of Michael Page's $5,000 Super Late Model Spring Championship victory. “I feel like I’ve let a couple of wins get away from me so far this year, so it was definitely a confidence booster to get the win," Horton said in a team release. ... Mason Massey (604) and Dylan Knowles (602) won Crate features. Deal won on the undercard of Jonathan Davenport's Lucas Oil Late Model Dirt Series victory. Adam Partain won the four-car Crate feature. Josh Herringdine won the 602 Crate feature over Wesley Robertson. Hurst led all the way. Elston took the early lead from Ray Raker and led the rest of the way. Reed briefly overtook Ewing late, but slipped up. Voigt started eighth. ... Zobrist improved 11 positions. Klein won his second straight at Highland. Moody won in Macon's Crate division for the first time, topping Little in the 20-lapper. Little led all the way. Klein earned $1,500 for his victory in the Lucky 40, a twice-postponed season opener. Jake Little won on the undercard of Brandon Sheppard's World of Outlaws Morton Buildings Late Model Series victory. Moody's victory was on the undercard of Brian Shirley's World of Outlaws Morton Buildings Late Model Series on Illini 100 weekend. 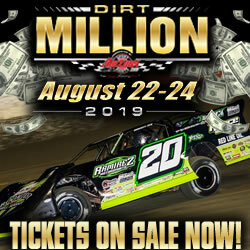 Miles won on the undercard of Kent Robinson's $5,000 MARS Super Late Model victory. Rainey notched his first Brownstown Crate victory. Webb, who overtook Marlar on the final lap, earned $2,000 for his first Super Late Model feature victory since 2010. A.J. Hicks won the Crate feature. ... 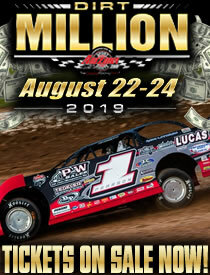 The track offers $100 for any driver who is the first back-to-back winner in each division; Lewis and Hicks are eligible. Jordan Hedger won the Crate feature while Josh Rice's older brother, James Rice, won the modified feature. Billy Green won the Crate feature. Chilton earned $2,000 in the season opener. ... He took the lead from Lee on the seventh of 30 laps. Rattliff earned $2,000 ... Jeff Watson won the Crate feature over Elliott Despain. Moore took the lead on the eighth lap and pulled away from the lead group late for his second straight victory. ... “My car was a little tight to start off with there, and I can’t say enough about my car and how it works down here. We’ve been trying stuff to get better here, and I think we got it,” Moore said. Moore led the final two laps for his first division victory. .... "I knew going into the final turn (Kershner) was going to try (a slide job) and I kind of had it planned to do a crossover on him, and man I can’t say enough about this car,” Moore said. The season opener drew 31 Super Late Models. Marrant won from the pole although a caution with two laps remaining zapped a 1.5-second lead. ... "That was nerve-wracking," Marrant said. "I thought, 'You've got to be kidding me.' The car was awesome tonight. Everything worked out." Russell won from outside the front row. "It's a really good way to start," said Fennewald, who took the lead near halfway. "I've raced for a lot of years and brought out brand-new cars before, but I've never won the first night." Hughes won on the undercard of Ashton Winger's Mississippi State Championship Challenge Series victory for Super Late Models. Ashley Newman won the Crate feature over Nathan Brown. Sheedy steered his Trak-Star his first Super Late Model victory. ... "It felt really good to see the hard work and dedication over the years pay off," Sheedy told the Columbus Dispatch. ... Chace Pennington won the 602 Crate feature. Josh Thomas won the 602 Crate feature. Randy Pfaff won the 602 Crate feature. McCormick's victory came on the undercard of Matthew Nance's Blue Ridge Outlaw tour victory. The track ran Saturday after a Friday rainout. ... The event drew 21 Late Models. Making his debut at the track, Overton won the Thursday night special as part of the Skyler Trull Memorial weekend. Chase McCormick won the 602 Crate feature. Blackburn won on the undercard of Zack Mitchell's Ultimate Southeast victory. Payne earned $2,000 in the season opener. ... Jacob Anderson won the Limited Late Model feature. Birkley won the track's first IMCA-sanctioned Late Model event. Bidwell won the makeup of last season's postponed Dutch Hoag Memorial. Drown made a high-side pass of Markham on the 15th lap. ... Duncan started 11th. ... Drown also won the super stock division feature. Bores edged Stemler after a side-by-side battle over the last six laps. Conley led all the way for his 37th career Hilltop victory. ... April 19's Jeff Norris Memorial for Super Late Models pays $2,000-to-win. Drown led the final four laps for his 25th career Attica victory. The 77-year-old Conley added another winning season to his lengthy career. Mattern turned back Yoder amid traffic late in the race and led flag-to-flag for a $2,000 payday. Flinner started third, led all but one lap and won by a half-second margin in the non-stop 25-lapper. ... "This is the car we had in Florida and it’s really good. I hope nothing ever happens to it,” Flinner said. ... Devin Hart won the Limited Late Model feature, rebounding from a DQ the previous week. Starting outside the front row, Whitaker won by six seconds. ... Bigler advanced seven positions. Beard led all 20 laps. Frye led all 25 laps to win the season opener. ... He has 21 career Selinsgrove victories. Ferree led all 25 laps. Brad Rachels (604) and Michael Smith (602) won the Crate features. Hunter Blackwell (604) and Elvin Sawyer (602) won Crate features. Lowe overtook Ballenger on the final lap for his fourth victory of the season. Chris Flood won his first sportsman division feature. Walls started on the pole. Hunter Blackwell won the Crate feature, earning $1,200. Trammell overtook Smith with 10 laps remaining in the 30-lap feature. Wood earned $2,000 in the Larry Bates Memorial. Jason Welshan was the apparent winner but disqualified in postrace inspection and apparent runner-up Trevor Sise was disqualified eight days later. Drew Kennedy (formerly third) and Tyler Coffman (formerly fifth) failed to make legal weight. ... Ballenger's victory came on the undercard of Dale McDowell's $10,000 Spring Thaw victory for Super Late Models on the Ultimate Southeast tour. The event was originally a Southern Texas touring event, but ran unsanctioned because of threatening weather. ... Several series drivers still came with Horner topping Leonard. ... Horner donated his $717 winnings to help with medical expenses for injured driver G.W. Egbert III. Leading 30 laps, Emory notched his first Winchester Limited Late Model victory. ... Dale Hollidge won the Crate feature, ending runner-up Logan Roberson's two-race win streak. Quade overtook Kane on the 10th lap. ... Logan Roberson won the Crate feature, leading all 30 laps over Trever Feathers. Dan Gullikson won the USRA Limited Late Model feature. Brown's first-ever feature victory gave Irvin Brown Racing two straight victories following Robbie Scott's triumph in April 6's season opener. ... Donnie Dotson won the Crate feature over Brandon Weigle. Corey DeLancey won the Limited Late Model feature. Kyle Thomas won the Crate Late Model feature over Donnie Dotson and Michael Duritsky.